This book consists of three major parts. The first contains narrative chapters which provide a brief history of the French people, where the Hardouins/Ardouins lived in seventeenth century France, where they lived and to where they migrated: Colonial Virginia, Southwestern Pennsylvania, and Kentucky. The second contains Jack Hardin's book about early Hardin pioneers who faced danger from Indian attacks and experienced many hardships in settling Kentucky. And, lastly, supporting documentation from France, British Isles, and official court records extracts of Virginia, Pennsylvania, and Kentucky. Also, in Part III contains a series of Family Group Charts by which the Hardins and their Descendants may trace lineage back to the Immigrant Ancestor, Marc Hardouin (Mark Hardin [I]). Research for this Hardin book has spanned a period of approximately twenty-five years. I became interested in the Hardins when I began researching and collecting data for a book on my Shumate ancestors in the mid-1970s. In 1980, I obtained from a Shumate cousin a copy of the book entitled, The Shumate Family, A Genealogy, by Theodor-Friedrich von Stauffenberg. In perusing this book I first learned of a possible connection between the Shumates and the Hardins. In his book, von Stauffenberg wrote that Jean de la Chaumette (John Shumate [I]) and Marc Hardouin (Mark Hardin [I]) were both French Huguenot émigrés who had come to the Colony of Virginia in the early 1700s, who had been friends in England after they escaped from the religious persecution in their native France in the late 1600s, who may have served together in the English Army for a period of time, and who were neighbors and close friends in Elk Run, Fauquier County, Virginia, where both had settled. This story fascinated me to no end. T. F. von Stauffenberg presented the hypothesis that Marc Hardouin’s wife, Mary Hogue, was really Marie Madeleine (de la Chaumette) Hogue who married first an English Naval Captain by the name of Edward Hogue, and that she was the sister of Jean de la Chaumette. Being a native of Hardin County, Kentucky, I was also fascinated to learn that both the Shumates and Hardins were early pioneers in Breckinridge, Meade, Hardin, Nelson, and Washington Counties. In the early 1980s, I became acquainted with the French Army Liaison Officer, Lieutenant Colonel Jean-Pierre Jacquet, who was assigned to the U.S. Army Field Artillery School in Fort Sill, Oklahoma. I mentioned to him the story of these two old French families being early settlers in Virginia and Kentucky. He suggested that I should have some family research done on the two families in France. After he and his wife, Nadine, returned to their home in Normandy, they sought out and contacted Madame Anne Osselin, a well-qualified genealogical researcher, who was at that time Chairwoman of the Genealogical and Heraldic Association of Normandy. I then contracted with Mme. Osselin to undertake research on the De la Chaumette (Shumate) and Hardouin (Hardin) families in France. Mme. Osselin is a very competent researcher, and she quickly found much information and documentation on both families in seventeenth century France. Using the results of her research, I was able to publish my book, History of the Shumate Family, Kentucky Pioneers, in 1992. Now, I am including in Chapter 2 and Appendixes A and B of this book the reports and analyses of her Hardin research which she sent me and Mrs. M. E. Sanders of Baton Rouge, Louisiana, as well as the records extracts she obtained from extant Protestant Church Parish Registers and other sources held by various French Archives. My aim in writing and publishing both the Shumate and Hardin family histories has been primarily to assist all interested Descendants of these two old Huguenot families to trace their early lines of descent from their immigrant ancestors, Jean de la Chaumette (John Shumate [I]) and Marc Hardouin (Mark Hardin [I]) and to learn from whence they came in France. Therefore, to support the information I present in the narrative chapters of this book about the Hardins, I also include ten appendixes which contain official census data, marriage, probate, tax, and other records extracts about the early generation Hardins in Virginia, Southwestern Pennsylvania, and Kentucky. But, since I am not as well versed about each individual of the early generations of the Hardin family to the extent as I am with the Shumates, I will not attempt to provide a short summary of each person as I did in the Shumate book. I must rely upon others who had greater knowledge about them to tell their story. And, as one will soon learn when perusing this large book, only the surface of the Hardin family history has been scratched. To do a really thorough job of reporting on this family would require many more years of research and unlimited funds which would result in not just one book, but volumes. Today, the Hardins are a very large family with many Descendants throughout the country. However, I hope that the information I present in this book will help the reader to differentiate between the Hardins and the allied Harding family who came with them as early settlers of Kentucky. This Hardin family history consists of three major parts. The first part contains narrative chapters which provide a brief history of the French people, where the Hardouins/Ardouins lived in seventeenth century France, and where they lived and to where they migrated in Colonial Virginia, Southwestern Pennsylvania, and Kentucky. The second part is a copy of Jack Hardin’s book about the early Hardin pioneers who faced danger from Indian attacks and experienced many hardships in settling Kentucky. The Hardin family has produced many outstanding citizens for our country; renowned lawyers, soldiers of the frontier, generals, doctors, educators, Congressmen, and other public servants. And, the third part contains supporting documentation from France, the British Isles, and official court records extracts of Virginia, Pennsylvania, and Kentucky. 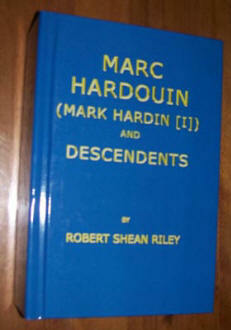 Also, in Part III is Appendix K which contains a series of Family Group Charts by which the Hardins and their Descendants may trace their lineage back to the Immigrant Ancestor, Marc Hardouin (Mark Hardin [I]). Many readers or members of collateral lines may question why information about those families is not included. The answer is quite simple. This book is only about the Hardin family. To include information about the many collateral lines--those which the Hardins married into--no doubt makes the task of writing this family history impractical if not impossible. Therefore, the aim which I outlined previously above is a challenging and difficult task for a single writer to accomplish. If an individual desires the history about a collateral line, then he or she should seek out that family history, if it is already in print, or if it is not, he or she may decide to assume the task of researching and writing it. My research for this Hardin book has spanned a period of approximately twenty-five years. In preparing this book for publication, the task became almost a full-time job to write, revise, and prepare the manuscript in the required "camera-ready" format.